You might know William Klein for the striking black and white photographs he took for Vogue in the 1950s and 60s, showing couture models cutting through the hubbub of New York and Rome. These, and his documentary street photographs – full of movement and danger and noise – are the subject of a forthcoming exhibition at Tate Modern, shared with the Japanese photographer Daido Moryama. Or perhaps you know him for Mr Freedom, his 1969 political satire about a feckless American superhero in France, or his send up of the fashion industry, Qui êtes-vous, Polly Maggoo?, released three years previously. You might even, if you’re a boxing fan, know his documentary Muhammad Ali: The Greatest 1964-74. It is unlikely, however, that you’re familiar with the abstract paintings that he was producing, to some acclaim, in France and Italy in the late 1940s and 50s. This month, HackleBury Fine Art in London presents an exhibition of these little known works alongside some of Klein’s graphic design and abstract photographs, illustrating yet another chapter in the biography of this creative polymath. The New York-born Klein was too young to fight in the Second World War, but in 1946 he was sent to Germany as a military radio operator. He soon made his way to Paris, where he studied painting at the Sorbonne under Fernand Léger. His paintings from this time bear the unmistakable influence of his master, and show figures in flattened scenes such as cafes or the Paris Metro. Klein’s work became bolder, and more abstract; soon the figures disappeared altogether. In an exhibition in 1952, in Milan, many of his paintings consisted only of black, white and red geometric shapes. Even at this early stage it is easy to sense Klein’s urgent desire for his paintings to move, to seethe with the speed and unpredictability of modern urban life. When an Italian architect asked Klein to paint rotating panels as room dividers for a new apartment, he jumped at the chance. 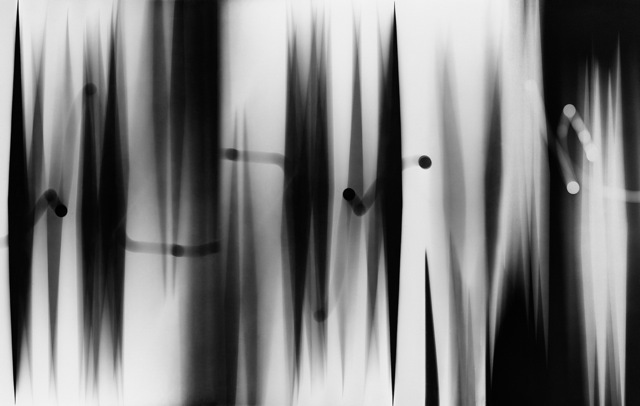 It was these works that provided him with his first breakthrough; while photographing them, somebody turned one of the panels, blurring the long exposure and creating the type of kinetic image for which Klein had been searching. Klein began to find ways of controlling such happy accidents. Pieces of card with holes cut in them allowed him to paint with light onto photographic paper. He called these works ‘photomurals’, despite the fact that he was only able to print them, at the time, at modest sizes. For this exhibition, HackleBury Fine Art has republished many of these spectacular works as large-scale silver gelatin prints. In 1954 Klein returned to New York. The city had changed hugely since his childhood, and he began to photograph it. The pictures he took became the basis for a series of ‘painted contacts’ – prints that he over-painted with bold coloured enamel, also in the exhibition. Despite his subsequent achievements, Klein was always an artist first and a photographer or a filmmaker second; it was his outsider status that allowed him the freedom and irreverence in those fields that is celebrated today.